Esau (עֵשָׂו, Esav) was the oldest son of Isaac and Rebekah and the twin brother of Jacob in the biblical Book of Genesis. Esau is considered to be the father of the Edomites, a Semitic people living south and east of the southern kingdom of Judah. The relationship between Jacob and Esau revolves around competition for the birthright of the first-born, involving trickery, exile and eventual reconciliation. Although he stood first in the line of inheritance, Esau sold his birthright to Jacob, who later tricked him out of receiving Isaac's blessing. As a result, Esau planned to kill Jacob once Isaac died, but Rebekah wisely arranged for her younger son to flee to her relatives in Haran. Esau became a wealthy man in his own right, and when Jacob returned 21 years later, Esau forgave and welcomed him. The two brothers lived separately but in peace thereafter. Their reunion is lifted up in some traditions as a model of reconciliation and peacemaking. According to the Hebrew Bible, Esau was born miraculously to Isaac and Rebekah after twenty years of marriage. Rebekah had been barren, but Isaac's prayers for her were answered when she finally conceived. During Rebekah's pregnancy, "the children struggled together within her" (Gen. 25:22). When she prayed about the pain God told her that "two nations" wrestled within her womb. "The one people shall be stronger than the other people; and the elder shall serve the younger" (Gen. 25:23). Esau was born immediately before his twin brother Jacob, whose hand grasped Esau's heel. His name, "Esau," derives from the Hebrew word for "red." The biblical narrative explains that "the first to come out was red, and his whole body was like a hairy garment." Esau and his twin brother were markedly different not only in appearance, but also in character and behavior. Esau was a "skillful hunter, a man of the open country," but Jacob was a gentle man who preferred to stay close to home. Esau was favored by his father, Isaac, while Jacob was favored by his mother, Rebekah. Rabbinic sources go further in their description of the boys explaining that whereas Jacob spent his time studying and learning to be a responsible and religious person, Esau by contrast scorned anything that was good, considering good people foolish and kind people silly. Instead he preferred to enjoy himself in any way that he could even if other people got hurt. One day while Jacob was cooking a pottage of lentils, Esau returned from hunting, faint from hunger. Esau asked for some but Jacob explained that they were for their father. Esau asked why Jacob was cooking cheap lentils instead of meat. Jacob explained that Abraham had died and that eating lentils was a sign of mourning. An altercation followed in which Esau said he despised his birthright and was willing to sell it for a bowl of lentils. Jacob agreed to give him in exchange for his birthright as the older brother. Esau agreed, saying, "I am going to die—what is this birthright to me?" (Genesis 25:29-34). Esau did not tell his father that he had sold his birthright. After this event, Isaac moved the family to the Philistine town of Gerar because of a famine. The text does not indicate whether Esau or Jacob accompanied them during this period, in which their mother was taken into the harem of the Philistine king Abimelech "for a long time." By the age of forty, Esau, had taken two Hittite women to be his wives: Judith, daughter of Beeri, and Basemath, daughter of Elon (Gen. 26:34). This, however, displeased his parents, who preferred that Esau to have chosen his mates from among the Hebrews. Esau's wives were thus "a grief of mind unto Isaac and to Rebekah" (Gen 26:35). When Isaac was old and nearly blind, he told his eldest son, Esau, that he wanted to bless him before he died. Esau did not tell his father that he had sold his birthright to Jacob years before. He went out into the countryside, as Isaac instructed, to hunt for some venison for his father to eat before he gave him the blessing. Rebekah overheard this exchange and remembered the dream God had given her when she was pregnant. She realized that Jacob was the one who ought to receive the blessing. 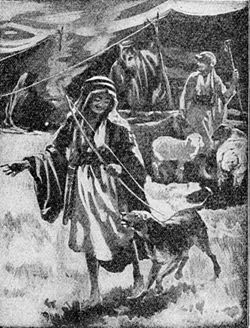 So she instructed Jacob to fetch her two goats so that she could prepare a tasty meal for his father. She then told Jacob to bring the meal to Isaac to receive the blessing in his brother's stead. Jacob worried that his father might notice the substitution through touch, since Esau was hairy and he was smooth. "'What if my father touches me?' he asked. 'I would appear to be tricking him and would bring down a curse on myself rather than a blessing'" (Genesis 27:12). Rebekah took responsibility for the act, saying, "Let the curse fall on me." She then disguised Jacob by placing hairy goatskins over his neck and arms. Jacob went into his father's tent. Isaac was surprised that he had returned so soon from the supposed hunt. "Who are you, my son?" Isaac asked suspiciously. "I am Esau your firstborn," Jacob replied. Isaac was still suspicious and asked to feel him, since Esau was hairy. The goatskins seemed to fool him, although he declared, "The voice is the voice of Jacob, but the hands are the hands of Esau." Nevertheless, Isaac blessed him. You will live by the sword and you will serve your brother. Jacob's trick had left Esau in a position of servitude which Isaac had not intended. However, once Isaac had given his blessing to Jacob—even under false pretenses—it could not be taken back. Esau was still unwilling to recognize that the blessing belonged to Jacob. He planned to kill Jacob as soon as Isaac died. However, Rebekah advised Jacob to flee to her relatives in Haran, winning Isaac's support for the plan on the grounds that Jacob could find a wife from among the Hebrew women there. Isaac agreed and commanded Jacob: "Do not marry a Canaanite woman." Esau then realized how displeasing his own wives were to Isaac. Still seeking to please his aging father, he went to his uncle Ishmael, Isaac's half-brother, and received permission to marry Ishmael's daughter, Mahalath, in addition to the wives he already had. Twenty years pass in the narrative with no report of Esau. In the twenty-first year, however, Esau learned of Jacob's approach with a major caravan of people and livestock. Although Jacob sent messengers ahead with assurances of his peaceful intent, Esau had been bettered by Jacob twice before. He was still nursing his resentment and had been waiting for many years to get his own back. So he went out to meet his brother with four hundred men. On his way, however, Esau encountered three more messengers each with a rich gift of livestock, consisting of a total of "200 female goats and 20 male goats, 200 ewes and 20 rams, 30 female camels with their young, 40 cows and 10 bulls, and 20 female donkeys and 10 male donkeys." When he asked the messengers to whom they belonged he was told, "They belong to your servant Jacob; he sends them as a present to my lord Esau, and he is behind us." Esau's heart was touched by the humility shown in the reply. He started to think that maybe his brother had changed. The next day, as Esau neared Jacob's train, he saw Jacob in the lead, followed by what must have been his wives and children, slaves, and a large herd of various livestock. As Jacob approached, he bowed to the ground seven times before Esau. Forgetting his anger, "Esau ran to meet Jacob and embraced him; he threw his arms around his neck and kissed him. And they wept." (Gen. 33:4) Jacob introduced Esau to his wives and children, and they, too, prostrated themselves before Esau. Esau, who himself had grown rich in Jacob's absence, said Jacob's gifts were not necessary, but Jacob insisted that Esau accept then as a token of peace: "If I have found favor in your eyes, accept this gift from me. For to see your face is like seeing the face of God, now that you have received me favorably" (Gen. 34:10). Their brotherly reunion after years of enmity is lifted up as a model for reconciliation. While Jacob is often credited with this success, Esau must also be given his due for putting aside his smoldering anger and forgiving his brother. 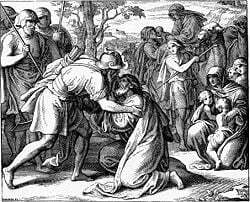 Esau then offered to have Jacob accompany him to his home in Edom, but Jacob declined, pleading that his wives and children would slow the caravan down. In fact, Jacob intended to return to Canaan, the land of his fathers Abraham and Isaac, and where he could finally exercise his birthright. Thus he turned and settled in Succoth, later moving to Shechem and Bethel. The two brothers and their growing clans apparently continued to live peacefully, but separately, from then on. Their only reported reunion occurred at the time of the death and burial of their father Isaac near Hebron (Gen. 35:29). Esau's legacy carries on the complexities of being both a blood relative and an enemy of Israel at the same time. He is said to be the forefather of the Edomites, one of Israel's neighbors and occasionally both a vassal and an enemy. A genealogical account of the growth of his clan to become the nation of Edom is given in Genesis 36. Since they were related by blood to the Israelites, the Edomites were exempt from God's command that Joshua "drive out" the Canaanites and slaughter those inhabitants who resisted conquest. However, in accordance with the earlier prophecies concerning Esau, the Israelites viewed the Edomites as destined to be subservient to them, even though the Israelites were latecomers to the land. 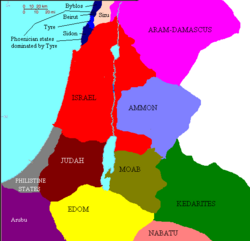 Edom was at times a vassal state to the southern Kingdom of Judah. In New Testament times, the Edomites were known as the Idumeans. Although they came to accept Judaism, they were seen by many Jews as racially impure and religiously suspect. Historically, the most famous Idumean Jew was King Herod the Great. His status as a descendant of Esau and the Edomites did not help his popularity in Jerusalem and Judea. Thus even at the time of Jesus, the descendants of Esau and Jacob were still being challenged to work out their relationship. Biblical scholars often view the story of Esau as a legendary account originating in later Israelite traditions concerning their neighbors, the Edomites. Thus, Esau's character reflects the Israelite attitude that Edom is destined to "serve" Israel even though the Israelites were relative latecomers to Canaan and thus "the younger son." The relationship of Esau's name to the word "red" is probably due to the reddish sandstone prevalent in parts of the territory of Edom, more than to the color of Esau's hair, or the color of the lentils he is said to have eaten for the price of his birthright. The general narratives concerning Esau belong to both the Elohist and Yahwist sources (see documentary hypothesis). The Priestly source (P)—which adamantly opposed intermarriage between Israelites and Canaanites—is credited with the story that Esau's marriage was so distasteful to his parents that they sent him away rather than allowing him to intermarry with local women (Gen. 28:1-4). The multiple sources of the narrative also account for the discrepancies in the reported names of Esau's native wives. In Genesis 36, they are named "Adah daughter of Elon and Oholibamah daughter of Anah and granddaughter of Zibeon the Hivite," rather than "Basemath daughter of Elon and Judith daughter of Beeri" as in Genesis 26. Basemath, meanwhile, is named as the daughter of Ishmael in Genesis 36, while Mahalath is so named in Genesis 28. While at least one traditional Jewish source praises Esau's filial piety (Tan., Kedoshim, 15), the vast majority of rabbinical authorities strongly condemn his character, while justifying Jacob's seemingly unethical behavior toward his older brother. One report holds that Esau sought to harm Jacob even in their mother's womb (Gen. R. 63). Another tradition describes him as physically indistinguishable from Jacob until they were teenagers (Tan., Toledot), while a third describes him as a misshapen dwarf from birth (Gen. R. 65). It is said his "hairy" appearance marked him a sinner, and his "red" color indicated his bloodthirsty character (Gen. R. 63). The reason Jacob demanded such a high price for the pot of lentils he sold to Esau, was that this was a dish he had prepared for Isaac, who was mourning the death of Abraham while Esau was out hunting (Pirke R. El. 33). To make matters worse, Esau had not only been out hunting on such a solemn occasion, but had committed murder that very day. Esau also adopted a blasphemous attitude in accepting the bargain and proved himself to be no filial son (Gen. R. 63). Moreover, whenever Esau had previously succeeded in his hunting, he had always refused to share his own meals with Jacob (Pirke R. El. 50). Esau won the affection of Isaac not by his own merit but through lying and insincere flattery (Targ. Pseudo-Jon.). Isaac's blindness was caused either by his grief because of the idolatry of Esau's wives (Tan., Toledot) or from trying not to see Esau's own evil deeds (Gen. R. 65). In fact, Esau spent much of his time visiting idolatrous shrines (Gen. R. 63). Esau not only planned to kill Jacob, but actually attempted to murder him. It was this act that caused Rebekah to send Jacob to her brother Laban. 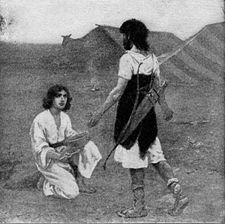 Esau then conspired with his son Eliphaz to ambush Jacob on the road to Haran, but Eliphaz failed to fulfill this mission after Jacob bribed him (Sefer ha-Yashar 50). 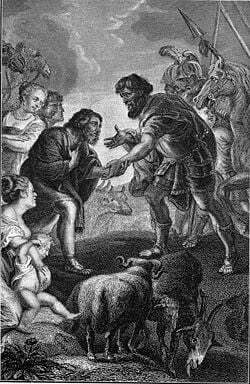 Increasing in wealth, Esau relocated from Canaan to Seir after he and his children feuded with the inhabitants of Canaan (Sefer ha-Yashar 50). When Jacob returned to Canaan, Esau was dissuaded from his warlike purpose by four mighty angels, each of whom appeared to Esau like an army of two thousand soldiers. Only because he thought himself outnumbered, Esau resolved to meet Jacob instead of making war on him. Finally, it was Jacob who received Esau with brotherly affection, rather than the other way around (Sefer ha-Yashar 50). Some rabbis hold that Esau really repented at this meeting; while others maintain that even in this scene he played the hypocrite (Gen. R. 78; Ab. R. N. 34; Ex. R. 5). The reason Jacob separated from Esau after their meeting is that Jacob knew that Esau lay in wait to ambush him. Nevertheless, Jacob and Esau did meet amicably and compete in showing filial piety at the death of Isaac. Esau's death was brought about in an argument with Jacob's sons over their right to bury their father in the cave of Machpelah (Sotah 13a). To summarize the account given in the Sefer ha-Yashar: Esau resorted to war, and was slain by Dan's son, Hushim. ↑ Frants Buhl, Emil G. Hirsch and Solomon Schechter, Esau, Jewish Encyclopedia. Retrieved August 8, 2007. Buhl, Frants, Emil G. Hirsch and Solomon Schechter. Esau, Jewish Encyclopedia. Retrieved August 8, 2007. This page was last modified on 30 August 2008, at 01:23.